The Ukrainian government has issued a blow to people living in areas under the control of Kremlin-backed militants. That at least is how many Ukrainians from Donbas view measures taken which could leave some of the most vulnerable people in Donbas effectively abandoned. First on Nov 7 the government announced that it would no longer be paying any social benefits or pensions to people living in areas under the control of the militants. Those due such benefits – and Donbas is an area with a huge number of people receiving them – have until Dec 1 to leave for areas under government control and register as displaced persons. If they do not, the pensions, etc. will be allocated, but they will only be able to receive them when the area is back under government control. The Cabinet of Ministers has just issued a list of populated areas which fall into this category. At the same time, President Petro Poroshenko has issued a decree which brings into force recommendations from the National Defence and Security Council. This decree has some ominous elements indicating that the government believes fully-fledged war could be imminent. It also orders that all public sector institutions, and penitentiary institutions be moved from the militant-controlled territory. It gives the National Bank of Ukraine a month to stop servicing bank accounts, including bank cards, on the territory where the ‘anti-terrorist operation’, as the fighting is called, is taking place. How the penitentiary institutions can be moved is unclear. The Security Council suggests that an amnesty be applied with respect to people serving sentences for all but grave crimes. People released from prison always encounter great difficulties in rebuilding their lives. In the present situation it seems more than likely that many prisoners would resist the idea of being released into total uncertainty. Until now the staff of such institutions were paid on bank cards from the central budget. That, according to these new measures, will shortly change. The special status of the areas in question, established as part of the Minsk agreement has also been cancelled in response to the pseudo-elections which first breached the agreement. The reasoning as presented by Prime Minister Arseny Yatsenyuk on Nov 7 was clear: the Ukrainian state will no longer finance the terrorists who, heavily backed by Russia, have set up their so-called Donetsk and Luhansk people’s republics [DPR, LPR, respectively]. Those wishing to receive public funding need ‘only’ register in areas out of the militants’ grasp. There are, however, multiple problems. One could be resolved within 2 minutes or less since all that is needed is the President’s signature on the Law on Internally Displaced Persons [IDP]. This regulates the status and rights of at least 400 thousand people forced from their homes in the Crimea and Donbas.. The law was finally passed on Sept 20, and the fact that almost two months on it has still not come into force is scandalous. Many of those who returned to Donbas after the formal ceasefire did so because they had no chance of finding work anywhere else and nowhere to stay long-term. 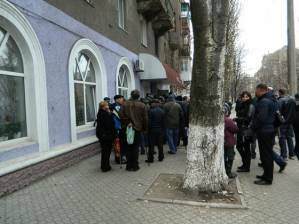 Lidia Kvashchenko writing for the Donetsk publication OstroV reports that since the government’s announcement there have been huge queues of people trying to re-register in order to receive their pensions, etc. She notes that the new measures have even led to the emergence of a new service with social networks full of requests to provide paid confirmation that a person is living in an area under government control. There are many, however – the elderly, people in poor health, etc. – who are not in a position to leave. Natalya, for example, is 55 and disabled after an accident many years ago. She lives with her 24-year-old son whose asthma has seriously worsened after he was caught in shelling in August and her 93-year-old mother. The elderly lady does not understand what is happening, and when she hears the sounds of warfare outside cries that the Nazis have come. Natalya says that her mother could die of panic and fear if she was forced to leave her home, and Natalya does not feel able to leave her for the whole day that it would take to travel outside Donetsk to register. Not only will they be unable to receive their pensions, but all public sector institutions, including hospitals, will, according to the new measures, be taken away. Nor is it only the old and infirm who cannot leave. There are Ukrainians who have remained because they cannot leave others in need. Another person from Donetsk, who stresses that he himself is impelled by his love of God, his country and people, posted even more bitter words on Facebook under the title “Is Donetsk not Ukraine? Or how the Kyiv authorities turned their back on Donbas”. He writes that some call the measures a ‘mistake’. He, however, believes it to be “betrayal and sabotage”. “Everything that the current government is doing is a demonstration that the occupied cities of Ukraine and the people living in them, waiting for liberation, are already not Ukraine and not its citizens. And it looks as though nobody was or is planning to free Donbas, and all these thousand deaths are merely a bloody spectacle. The establishing of borders, the rejection of their citizens in occupied territories, that is nothing but the government’s acceptance of DPR with its borders and the legalization not of a terrorist organization, but a new improvised structure”. The author writes that if Ukraine’s leaders were really concerned about Ukraine remaining whole, they would do everything so that the entire country was working for victory. Instead, he says, there are volunteers, patriots, who are bringing food and clothes to help those in need, many are sacrificing their own health, fighting and dying while others live their ordinary lives, watching reports on their TV screens about some kind of war. This is perhaps the brutal truth about most conflicts where those not directly involved observe from a safe, and comfortable, distance. The situation here is, however, different. The government’s reasoning behind the latest moves is clear and can be understood but, without providing realistic assistance for all those trapped by the fighting, the new measures will leave many simply abandoned – and those who have remained in Donbas tirelessly helping other Ukrainians in their own country feeling understandably betrayed. Previous Steps continue towards a party of labour in Ukraine!